Where do I train in Vancouver? A few weeks ago, I got the opportunity to go out west and race in Whistler, BC, at IRONMAN Canada and 70.3 IRONMAN Canada. Part of my travel plans included spending some time in Vancouver, BC. If you’re someone that enjoys the outdoors, Vancouver is the spot to be. Training in Vancouver is incredible. The city offers a variety of terrain, with ocean and mountain views minutes from downtown. Also, commuting in and out of the city is easy on a bike, making training on one of the three mountains (Cypress, Grouse and Seymour) easy. You also have numerous fresh and saltwater swimming locations. Here we have included a few locations in Vancouver where you can train while on vacation or if you’re looking to get into the sport. The city has many triathlon, running and bike clubs in the area, making it easy to find a training group. 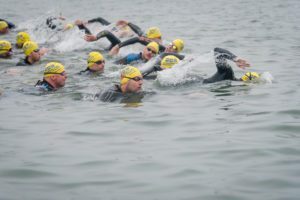 There are a bunch of areas to go for an open water splash; Deep Cove, Kitsilano Beach, and out in Coquitlam, Bunzsten Lake. Make sure when going for a swim you check the water quality in the area, recently at Kitsilano and the surrounding beaches, E. coli levels have been high. When doing open water swims around boats, make sure you have a buoy with you or a friend on a paddle board/kayak to stand out. Kitsilano Beach also has a 137m saltwater outdoor pool. With Vancouver’s bike network system, you can go anywhere. Popular training areas include UBC, Iona beach, Stanley Park, Horseshoe Bay, Deep Cove and Fort Langley. A short and explosive ride in the city is doing laps in the early morning around Stanley Park, also known as “the Sploop.” The loop features a punchy climb up to Prospect Point. Those that want to do a 30-minute to an hour effort, go to Cypress or Seymour Mountain. For a bit more climbing, hang out around North Vancouver and add Grouse Mountain to your ride. If doing one mountain isn’t enough for you, do all three, also known as the “triple crown.” It’s a 100K ride that features over 2,000m of climbing. A peaceful place to ride, with some climbs, is the Seymour Valley Trailway. You get access to this bike path at the top of Lynn Valley Road, and it goes to Seymour Lake. Plan your ride out here in the morning or during a work day to avoid the hundreds of cyclists and hikers that flock here. This ride is one of my favourites because of the canopy formed by the trees, and the mountains that surround you. If you have the means and time, get a ride up to Whistler. Here you can ride the Ironman course and venture up Callaghan Valley. You may also want to venture up to Pemberton. Make sure when you’re in the area to exercise caution on Highway 99. Being in the city, you’ll have lots of access to local running tracks. Some great locations to go for a tempo, interval or long run include Stanley Park, Lynn Valley, Pacific Spirit Park and Kitsilano beach. In Vancouver, you really can’t go wrong heading to the shoreline and be doing uninterrupted runs for kilometres. For trail running, do the Grouse Grind and explore the surrounding hiking trails. Or, just strides from downtown, run the trails in Stanley Park. Lynn Valley is also a favourite spot to go for a trail run.